I was reading a Daring Fireball post late last night about how the market share argument for Apple is irrelevant, as Apple puts 'profit share' ahead of market share. I completely agree with the thesis because its true, and anyone pointing to this as a negative for Apple simply does not know the space or Apple. 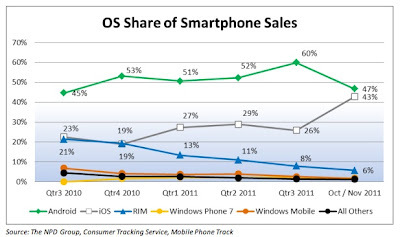 Yesterday afternoon, new market share numbers were released where the iPhone went from 26% smartphone share to 43% share, and Android went from 60% to 47% since October. This is the first piece of solid evidence that suggests iPhone, when offered on multiple carriers, can truly dent Android growth. Before this there was only anecdotal evidence. For instance, at&t grossly outselling iOS devices vs android devices from Dec 1 to 27th. Another, more important reason w/respect to Apple's stock, is that prior to the new market share numbers, Apple controls 2/3 of the profits of the mobile phone market. And since the iPhone pricing has not deteriorated, it is pretty safe to assume every market share gain for iPhone represents a huge earnings bump.